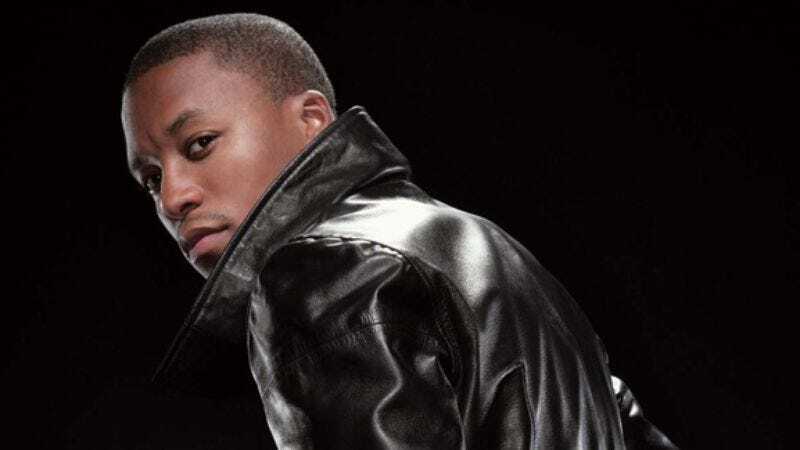 Lupe Fiasco seemed to erupt out of nowhere with the explosive one-two punch of "Touch The Sky"—his smash-hit collaboration with his friend Kanye West—and the infectious skateboarding anthem "Kick, Push." But Fiasco endured a pair of major-label deals gone awry—one as part of a pre-fab rap group called Da Pak, the other a solo deal—before hooking up with Atlantic to release Food & Liquor, one of the decade's most audacious, original hip-hop debuts. Between busted deals, Fiasco generated a steady underground buzz with well-received mix-tapes highlighted by versions of West's "Diamonds From Sierra Leone" and "Jesus Walks." Fiasco's debut, Food & Liquor, executive-produced by Jay-Z, reflects Fiasco's devout Muslim faith and eclectic interests in skateboarding, giant robots, science fiction, and trippy Technicolor storytelling. The A.V. Club recently spoke with Fiasco about bootlegging, skateboarding, reconciling his values with his passion for hip-hop, and preferring Nas to Jay-Z. The A.V Club: You were a special guest during Kanye West's set at Lollapalooza. What did it feel like to be performing in front of a hundred thousand people against the Chicago skyline? AVC: It wasn't a life-changing moment? LF: Nah. Those experiences have come and gone. That wasn't even the most insane show thing that could happen. We've done shows—we'll be in Dublin, and it will be nonstop pandemonium to the point where you think the crowd is going to implode, because they're making so much noise and they're so excited. So when you get that reaction, it's cool, when people are loud and like [mimics screaming], but we get the shows where it's absolute mayhem. AVC: Do you get jaded the more you experience that? LF: Not really jaded. You just get used to it. I don't think it's as extreme as being jaded. It's more like "Eh, all right. Another show." AVC: Do you think that was a big moment for Chicago hip-hop in particular? Having you and Twista and Common and Kanye all there at the same time? LF: I don't know. I'm kinda out of touch with Chicago, to tell you the truth. I haven't been there in so long to see the effects. I've been working this whole time. Even the time when Kanye came out and was smashing and smashing, and when Common came back out and Rhymefest and me, I hadn't even been in the city to experience what impact it has, because I've been all around the world working just as much as they have. I don't think even Kanye has been back to see exactly what effect he's had on the city. AVC: Do you think Kanye has opened doors for Chicago rappers? Made it easier to be a little different from the norm? LF: I think that's overall. I don't think that he's made it easier for just Chicago rappers. AVC: A lot of people think you came out of nowhere, but you've been around for years. Your first deal, you had a group called Da Pak, right? LF: Da Pak was a group out of Chicago. It was a put-together group. We actually met for the first time at this showcase. They were like "Yo, you should do a song together." So we did. It just so happened that the name of the song was "Wolf Pak." They said, "Y'all should be a group called Da Pak, and here's a record deal." AVC: What was that like, having that dangled in front of you? LF: It was cool. It wasn't what you expected. You expect certain things. You build up in your mind how it's supposed to go down. When you get a record deal, you think you're supposed to get X, Y, and Z. It doesn't happen like that. You're like "Oh, this isn't as exciting as I thought it was going to be." But it was cool. It was really weird, because we didn't know each other. AVC: Why did they think you guys would work well together? LF: I guess because they felt like if we were all good solo MCs, then we would make a great group. AVC: So what happened with that? Did you start to record an album? LF: We did about 50 songs, something like that. We pulled together an album, and then it was like we didn't have any creative control, so the songs were wack. The first single was kinda wack. I hated it. Then you get that "I hate this song. They hate this song. We don't want to rap like this. We want to rap like that." But you have no creative control. So people weren't really happy with the project. And then the A&R got fired. We were signed to Epic Records, but then the A&R was let go. So when they fired him, they dropped all the groups he had signed. AVC: What was the single you hated? What kind of songs were they? LF: Some super-violent, club, status-quo songs. There were a few songs, since it was a group, you could play around with certain things. So there were certain concepts that were kind of cool, but the overall theme was this super-violent group of kids from the hood. AVC: Was it devastating to have a major deal and not really get anything out of it? To just get dropped? LF: You got experience. My victories are small. The things that I wanted out of it were pretty small. So just to go to New York was dope for me. Being able to go out on tour and perform and meet certain people who I was fans of, and they would be on the same stage as we were, it was cool. We got money. We got paid a little bit, so it wasn't all, all bad. It was just that I wanted to go out and do my music and express myself, and I couldn't, and that was wack. AVC: What was the first album that really made an impression on you? LF: Probably [Jay-Z's] Reasonable Doubt. No, actually, it was prior to that. I want to say NWA. It was a mash-up of certain albums. It would be a Spice 1 album, but I wouldn't know the name of the album, and it wouldn't be the whole album. It would probably be side A, because we were still on tapes. So it would be a Spice 1 album I didn't know the name of, I'd be rocking with that. Or, it'd be an 8Ball & MJG album. I remember "Space Age Pimpin'" was my joint. AVC: On "Hurt Me Soul," you rap about trying to reconcile your values with your love of hip-hop. Was that something you wrestled with from the beginning? LF: Early on, it was like, "Whatever, I don't like hip-hop." And then as I got into it, it went to the back burner. And then when I started making my own music, I was more about recreating what I was hearing. And then it got to the point where I was like "Hold on." I noticed that I had some control over what I was saying, and the effects that it's going to have on people. I wanted to focus more on the positive side of things, which are more in tune with my morals and ethics. AVC: What about Reasonable Doubt really spoke to you? LF: "Friend Or Foe": that song in particular. Then as I really got more into it, there were other songs like "Politics As Usual." Then my morals started to kick in, and I started going through the lyrics of like, "D'Evils" and I was like, "Whoa, I can't listen to this." Even to this day, I don't listen to Biggie. And I was a huge Biggie fan. I will not play a Biggie album. It's just so violent. And his earlier stuff was so over the top. And I was like "Nah, I can't listen to this." AVC: What about Tupac? Is that the same thing? LF: I like Tupac. The only album of Tupac's I really, really got into was All Eyez On Me. That was my Tupac album that I really liked. As an MC, he's just all right to me. He makes more of an impression as just the figure that he was. He was the James Dean-type individual, where his persona is what really appealed to people. His music—I'm comparing it to Jay-Z, and he's certainly not better as a lyricist than Jay-Z. That's what we were on, lyricism, so it was Jay-Z, Nas, Pharoahe Monch, and Wu-Tang Clan, different people where it was straight, straight lyrics. This was when we were 15, 16, 17, and if you wanted lyrics, then Tupac was just whatever. AVC: You've also said that your favorite album was Nas' It Was Written. LF: It was mostly the timing when I got into it. The music is great. Even though it was super-violent, it was the timing that hit me. I was 16, 17, and I was like "This album is fresh." The whole album is dope. It hit me at the most impressionable time. I started to define myself along those lines. You know how people are searching for who they want to be, or how they want to act in their teenage years. That album hit me right then. It was like, "Aw yeah. This is how it's going to be." I was impressed that he would have these violent songs and stories, and then he would do a song like "Black Girl Lost," which would make up for at least half of it. Even today, that's probably one of my favorite hip-hop albums. I probably bought that, like, six times. AVC: Two of your favorite rappers are Nas and Jay-Z. If you had to choose between them, who would you pick? LF: Nas. Me and my friends always say this: If we were stuck on a desert island, and you could take one hip-hop artist's catalog with you, who would it be? And I always say Nas. Illmatic all the way up to, what was his last one? God's Son. For me, what he represents is a little bit more in tune with the things that I'd like to represent or have represented, or that I can relate to a little more. I can't relate to the hustler lifestyle that intensely. But I can relate to some of the things Nas talks about. His aspirations. AVC: Your second record deal was a solo album. What happened with that? LF: That was the beginning of Food & Liquor. It was going good. You're building an album, you're working around as a solo artist and learning new and different things. And you get Jay-Z coming in to be executive producer, and you get all this other stuff coming in. Preparing yourself to be a solo artist. And toward the end of that deal, [label head] L.A. Reid got fired. We're wrapping up the album, actually doing final track-listing versions, and L.A. Reid gets fired, and the whole project gets shut down. There's no more Arista Records. We get hit with, "Do you want to go to Jive?" and first right of refusal, and things of that nature. That's what it was. It wasn't the music. It wasn't anybody's fault. It wasn't the A&R getting fired, it was no, they closed the whole record company down. AVC: How autobiographical is "Kick, Push"? LF: Not at all. "Kick, Push" isn't about me. It's about this kid by the name of Ken. He's not even a kid, really, he's in his 20s. That song is his life exaggerated with maybe a few stories of a few other people, and then some stuff I fabricated. I just added some of the stuff that I knew from being a skateboarder into it. AVC: How has the skateboarding community responded to that song? LF: They love it. The OGs love it. The new kids, even the kids who weren't skaters, who became skaters because of "Kick, Push." Of course, you've got your detractors for anything that you do. You've got a few skateheads going "You don't keep it authentic," and this, that, and the third, but for the most part, it's been good with people like Tony Hawk and Steve Williams. AVC: There was a dis song about that. LF: You mean from Team Ice Cream? AVC: Yeah. How did that make you feel? LF: Regular. For every person who says something good, who says "Kudos," there's always someone else who says something bad to bring you down. It's expected in the world. AVC: It's almost a form of validation. You know you've made it when people start doing dis tracks about you. LF: Yeah. When you start creating opinion, and you start creating difference of opinion, you're doing something. People are actually sitting down and critiquing. A lot of the stuff people hate, they really don't. They only look at the outer shell. They don't really get into it. Nine times out of 10, what happens when you start really looking at something, you start understanding it, no matter how vile it may seem. If you just look at it objectively, why people do certain things, you'll be like, "Wow, that makes sense." It could be something like the atomic bomb. If you look at why they were making the atomic bomb, you can see that point of view. "Yeah, that makes sense." A lot of people just look at the outside, that it's the atomic bomb, so therefore it's bad. AVC: Because of the way the song took off, do you feel like you became a spokesman for skateboarding? LF: Yeah, but I always shunned it. I'm always at the top of skateboarding royalty, I'm with Tony Hawk and Steve Williams, and with these people and this company, but I was often like, "Yo, I don't want to do this photo shoot with a skateboard." What really killed me was that people were trying to pigeonhole me, and magazines would get mad because I didn't want to do their photo shoot with a skateboard. Then when the album came out, people forgot about "Kick, Push." The rest of the album had nothing to do with skateboarding. And they said, "Oh, now we see why you didn't want to be the spokesperson for skateboarding." The album had nothing to do with skateboarding. It was just little things like that. AVC: What about "Kick, Push II?" What was the genesis of that? LF: "Kick, Push II" started out as a mix-tape record. I actually did it for MySpace. Where it was just supposed to be like, "Have you ever played Dungeons & Dragons?" How can I put it? It was like booster packs, extensions. Like, once you've beaten the game and played every level, it's like a new level, instead of making a new game. It's carrying on the storyline. So "Kick, Push II" is actually, like, digging into the characters. It gives you more of an understanding of why. You just got this blank story of the one character and what he goes through, and you're introduced to his girlfriend and his crew, and then "Kick, Push II" gives you more of a personal understanding of who those people are. It wasn't meant for the album. It just turned out we should put this on the album at the end of the day. AVC: Are you a fan of Dungeons & Dragons? LF: Not really. I've never really played it. [Laughs.] I understand it, though, what it is. AVC: "Spray Paint And Ink Pens" from the Touch The Sky mix-tape has a science-fiction feel. Are you a fan of science fiction and comic books? LF: Yeah, I'm a big fan of science fiction, animation, and things of that nature. Other worlds and that type of stuff. AVC: What stuff in particular? Anything recent that's really rocked your world? LF: Not really. I saw Sky Captain And The World of Tomorrow. That was fresh. But it's more like the classic stuff. I'm a big robot fan, so I love robots. Like Gigantor, and a bunch of other little things. AVC: Are you a big Star Wars guy? LF: No. I like it, but I'm not a fanatic. I can sit and watch it, but I'm not into it like that. I know a lot of people who are fanatics. I'm not even a big comic-book fanatic. I'm more a Japanimation fanatic, like Japanese comic books and stuff like that, the cartoons. AVC: Are you comfortable being considered a role model? LF: I guess. I step outside of myself and look back at the music that I make, and I'm comfortable with it, and with somebody following it. I like when little kids come up to me and they're three and four years old, and they're reciting "Kick, Push." As opposed to them coming up and saying, "I'm going to shoot you." To see that, I'm happy. AVC: Do you think rappers are role models whether or not they embrace the title? LF: Positive role models? No. But role models? Yeah. Everybody that's on TV has a voice. Unless you live in a box, and it's soundproof, and there's no windows or anything in it, you're a role model. As long as people can see you and participate in what you do, you lead them. You affect them in some way. So I think rappers, singers, actors, whoever, dancers, when they're on that screen, they touch 30 million people at this time, 10 million at this time, 100 million people at this juncture. You have to take even more responsibility for what you say, and what you do, and how you're going to affect people. AVC: How did "Conflict Diamonds" come about? LF: "Conflict Diamonds" began as a freestyle about seven days after Kanye released the original version of "Diamonds (From Sierra Leone)." I went to his people and told them I wanted to do a freestyle, because I had a song "Muhammad Walks," and I wanted to do it with Kanye, as a remix to "Jesus Walks," and they turned it down. So I just put it out on the mix-tapes. So the same thing happened with "Diamonds," where I went to them first and said "I want to do this song, I want to freestyle over "Diamonds," and asked if it was cool. And they said, "Yeah, sure, go ahead." I made "Conflict Diamonds." We released it overseas, and it took off. AVC: Why did they turn down the "Muhammad Walks" idea? LF: I think they didn't deem it as necessary. At that time, I wasn't popping. People played it on the radio. DJs got hold of it, and I think Common had a remix and someone else had a remix of "Jesus Walks," and they mixed it all together, so it was like one big super song. I don't know exactly, to tell the truth. AVC: Do you consider yourself a political person? LF: No. Social. I don't like politics. Politics is one or the other. A lot of people walk the line. To take one side means you disregard some of the real valid issues on the other side. I don't like doing that. I don't want to participate. I call myself more social than political. AVC: Your album was plagued by rampant bootlegging. Do you think that's flattering, like, "Wow, people are so eager to hear my music that they're willing to go the pirate route," or is it just maddening? LF: It was flattering. On the end of the people who were downloading it, it was cool. It was more of a shock to try and find out who was downloading it, or where the leak was coming from. To see the response it got from people was great. Even though it hurt in other areas, it was still good to know there was a movement of people out there who were interested in what we were doing. AVC: How did bootlegging affect the composition of the album? LF: Not too much. When it leaked, we were probably 60 percent done with the recording process, and we had 40 percent left to go. That 40 percent entailed the collaborations and a few other little records that didn't make the leak. We still had a big mass of songs to pull from, and it was only about seven songs in the leak that were going to make the final album. So we just continued with the recording process. People thought we went back and changed and did things that were new. No, we just picked up where we left off. AVC: Do you think the bootlegging hurt the first week's sales? LF: Yeah. I know that for a fact. When it leaked, it got real reviews from The Village Voice, and it was getting nice, nice, nice reviews. It was the Voice and a bunch of other stuff. People were going out to the record stores and asking if they had the new Lupe. They were like "No." They got so many requests, they would report back to the distribution centers, they call them one-stops. They would report back to the one-stops. We did a little tour of the East Coast and went to a one-stop in D.C., and they said, "You peaked two months ago." If we had came out within two weeks of when the album leaked the first time, we would have done double then what we're doing now. LF: It's a trade-off. To know you have a movement of people who are actually interested in what you're doing, and to get massive reviews for it is cool, because it gives you credibility as an artist. Which is one thing people thought we were lacking, because people only heard "Touch The Sky," "Kick, Push," and some mix-tapes, and they were really unaware. And then they got to hear a body of work, and they were ready. The trade-off was the first week's sales two months later. AVC: Jay-Z executive-produced this album. What did that entail? LF: He did a lot of stuff behind the scenes. He orchestrated the Mike Shinoda Linkin Park record. He smoothed over the Pharrell record. Just him being attached to the project opened up a lot of doors. It was real simple. I would record eight songs, then go to New York and play them for him, and he would thumbs-up/thumbs-down. Then it would be like, "Okay, let's go do some more." AVC: Was it intimidating, working with an icon of his stature? LF: Nah. Not at all. That mystique is gone. When I first met Jay-Z, it was like that, and then, when you know him five, six years and you're around him and you know how he works and things of that nature, it's not really intimidating anymore. When I went to do "Daydreamin'" with Jill Scott, I was like, hyped. "Jill Scott is in the studio!" She was like, "Whoa, calm down and tell me what you want me to do." [Laughs.] It was "Stop. This is business." AVC: You have to address those people as peers, not necessarily as, "Oh! I'm such a fan of your work!" LF: Yeah, I had to eliminate that. She told me, "You have to stop and tell me what you want me to do." Every other note or run or style I wanted her to do on the record, I had to stop and tell her to do it. AVC: How did the Kanye West "Touch The Sky" thing come about? LF: I've been knowing Kanye for years. We helped each other out before he had his deal. We were helping him take meetings with different people. We worked on some songs at Arista, and he called me and said he had this record that he wanted me to jump on, and it was "Touch The Sky." It was that simple. We went to the studio and recorded it. AVC: Did you have any idea that it was going to be huge? LF: No. I knew it was a dope record. It was one of the records that was getting the best response overall from people who listened to the whole album. It was one of the records that was getting a good response, but I didn't know it was going to be like that.